I am of the opinion that there’s enough stress to go around in this world, no matter where you live. And that includes Maui. 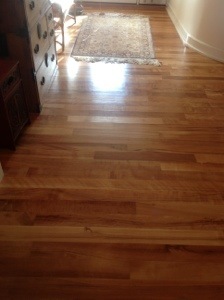 We got up this morning to the telltale signs of termites munching happily on our beautiful cherry floors. See their little holes? There are suddenly about eight of those. This is a headache, because termite treatment is a) expensive and b) a pain. I have refused to tent this house, because first of all, we’d have to move out, and second of all, there is an alternative method now to all those nasty chemicals: orange oil. This is what we used the last time the termites invaded, and we’ve at least fooled ourselves into believing it worked. Until now. 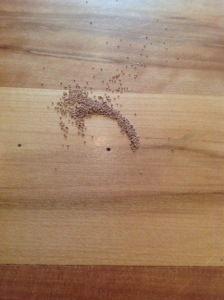 The termites are the least of what is on our minds on Maui right now. I presume you’ve heard about the latest shark attack, where the German tourist’s arm was bitten off in Makena? And in the last month, two people died while snorkeling off Black Rock in Kaanapali (separate incidents); one guy was a well-known newspaper reporter from my home town in California. Black Rock is very deceptive. People think that they’ll just swim out and take a gander at the turtles. The time I tried that I got caught in the riptide and couldn’t get back in, and almost drowned myself. Then, a father and son had to be rescued by helicopter while hiking in Iao Valley last week. It rained very hard last week, and they got disoriented. And the jungle is now in our house… so excuse me while I go call the orange oil people. This entry was posted in Life in Hawaii and tagged drowning off Black Rock, German tourist loses arm to shark, Iao Valley hikers rescued, Shark attack Maui tourist, snorkelers drown in Kaanapali by jamaicawtr. Bookmark the permalink.